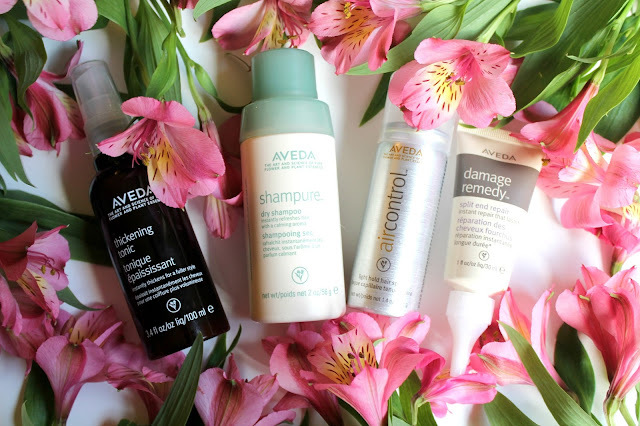 I love using the Aveda Thickening Tonic after I take a shower and blow dry my hair. I already have naturally thick hair, so I don't use much but it gives my hair so much volume and keeps it from looking limp and lifeless, plus it smells amazing! The Aveda Air Control Hair Spray is beyond amazing. My hair always has static for some reason and this hair spray helps to prevent that without making my hair feel crunchy and hard. It feels like I have nothing in my hair! It's a must have in my book. I love love love the Aveda Damage Remedy Split End Repair for the ends of my hair. For those of you guys who have been following me for awhile, you know one of the main reasons I cut my long hair (tears) was because my split ends were out of control. My hair was in a really bad place. I don't know if it was pregnancy and post partum hormones or just the lack of effort that I put into my hair after having Lilly, but it was a mess. This leave in product has been amazing at protecting my hair from that ever happening again, plus I love the scent on this as well. Even though I wear my hair straight most of the time, I still love a good curl every now and again. 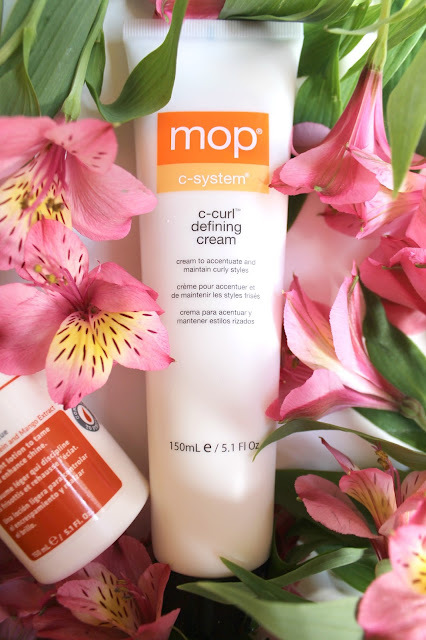 When I do decide to curl my hair, I love using the MOP C-System C-Curl Defining Cream. My hair naturally doesn't hold a curl for more than 5 seconds, so I typically need some help in that department and this product does just the trick! It helps my curls stay in all day which is a miracle for my hair! 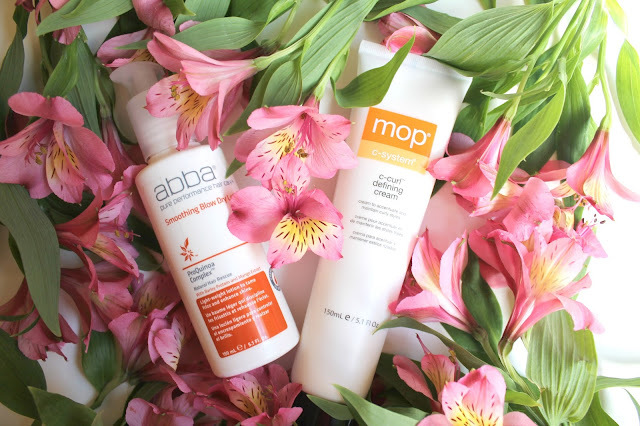 This ABBA Smoothing Blow Dry Lotion makes my hair feel SO soft and also helps keep my frizzy hair tamed. Everyone has noticed how different my hair is looking and how it feels so silky, and I have this product to thank for that! 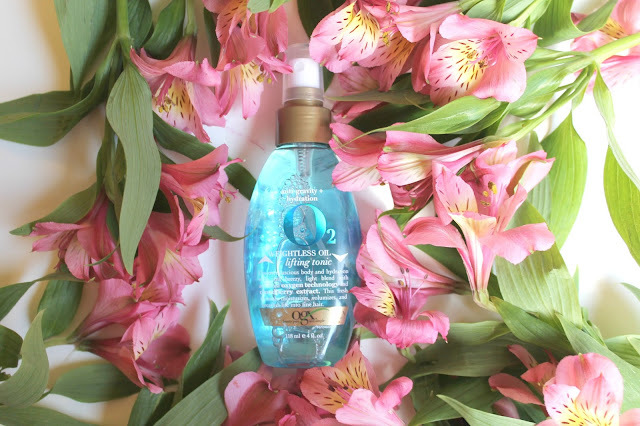 This product is like makeup finishing spray to my hair (if that makes any sense!?). It brings life to my hair throughout the day if my hair is starting to get dry, frizzy or just limp looking. It's great to carry around in your purse or diaper bag! 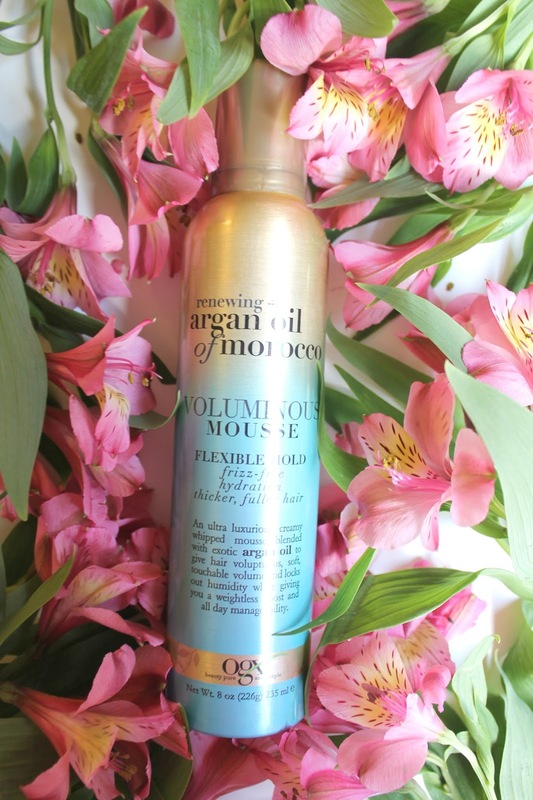 I love the OGX Argan Oil Voluminous Mousse for days I don't feel like messing with my hair. I just run it through my hair and scrunch. It gives my hair a natural and easy wavy look without too much effort and stays all day. It also smells amazing! Why not save the best for last right?! 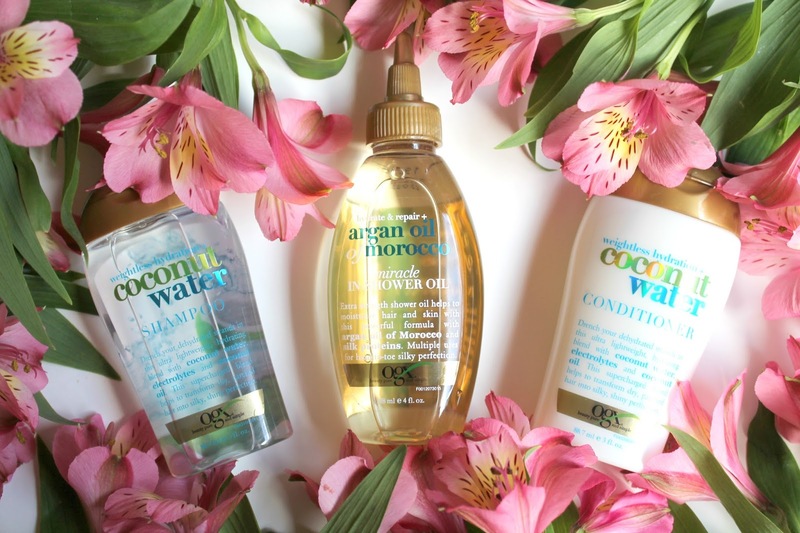 But seriously, this shampoo and conditioner duo from OGX beauty is quickly becoming my favorite of all time. They leave my hair full of life, shiny and voluminous. I'm obsessed! I use the Argan Oil In-Shower Oil with my conditioner by mixing the two and leaving them in my hair for a few minutes before rinsing out. The results speak for themselves. My hair has never been this healthy and soft. If you have any other questions about the hair care products I use, when I use them or how I style my hair just let me know! I'd be more than happy to answer all of your questions! I hope this was helpful & thank you for stopping by today! *All products mentioned in this post were provided c/o, however, all thoughts are my own. Love the OGX products. I'll have to try their shampoo/conditioner! They are so good! I love them!